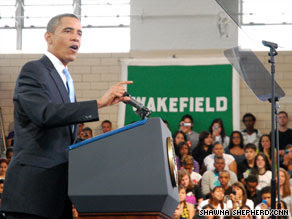 US President Obama to students on the first day of school. How did you think the President of the United States did today in his speech to school children? But my favorite part of his address was when he asked everyone to set a goal for themselves. No matter what your circumstances are, there is no excuse for not trying. Set goals for yourself so your life can make a difference. Is there ever an excuse to not have a goal? Every child and adult – everyone – needs a goal. I’m going to accept the challenge myself and throw down the challenge to any one reading this blog. Now is your time to look inside at your goal. What is your goal for yourself as a teacher this year? How are you going to make a difference? I often find it is hard to separate the “To Do” list from the goal. When I think of my goals I tend to think of all the things I have to get done. If I settle with “do laundry” as my goal, I think I may be selling myself short – not to mention being a pretty boring person. I’ve been writing, re-writing, changing things, fine-tuning my Vision and my goals for years. I do it to love myself. If I don’t set my own goals, others will do it for me. I worked too many years doing jobs to fulfill the goal of someone else. I’ve sorted bottles, cleaned dirty diapers, and helped homeless people. Achieving the goal of someone else leads to burn out. I’ve been there and don’t want to go back! I will leave my goal in the comments. If you want to see what it is – click on the comments (for those getting an e-mail, you’ll have to click on the title of the article to go to the comments). Before you click – think of what goal you are going to write for yourself in your own comment. If you don’t know what it will be for this year, at least write what you want to change! The challenge is thrown down. Who wants to love them self? Whether you’re a teacher or not, what is your goal? Do you want to spend more quality time with your loved ones? Start doing work that is more fulfilling? Find out what fulfills you? Develop a software that pays for a million orphanages? Just like all great teachers do…. the final decision is left up to you. What’s it going to be? Just like Obama did, I’m calling on each of you to set goals for yourselves for the upcoming year. @ PranaMama – love your goal! What a great role model you will be, and teaching others how not to be a doormat. My goal is to be honest with myself and others. I am no longer accepting things as they are, because my goal is to make things better. To accept things as they are is to be lazy. I am starting with my relationships with my family. I am no longer going to say what they want to hear, do what they want me to do, just for the sake of pleasing others. My opinion counts, and my happiness matters. Yes, this is self-serving, and that's okay because it's the first time I've ever treated myself with as much value or importance as others. Thanks for making that okay! Which in the end makes my life happier being around happier people and doing what interests me.